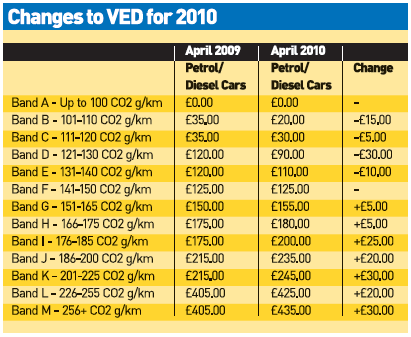 April 2010 witnesses the most significant changes to vehicle tax since the CO2-based tax system was introduced in 2002. Fleets face a tightening of benefit-in-kind (BIK) tax bands, new VED levels, BIK tax-free electric vehicles and a new ‘showroom tax’. Fleet operators have become used to tightening BIK tax thresholds, with announcements made in the Chancellor’s Budget or Pre-Budget reports. As of April, the lower benchmark in the main bands for BIK tax falls by 5g/km to 130g/km, although vehicles with CO2 emissions up to 120g/km still gain an advantage of at least five per-centage points. Petrol cars with CO2 emissions at 230g/km or higher and diesel cars with CO2 emissions of 215g/km or more now incur tax at the highest 35% rate. The changes have implications for fleets and drivers that do not plan far enough ahead. When it was launched early in 2006, the Chrysler 300C 3.0 CRD saloon was liable for BIK tax at 31% of its P11d value as a diesel car with CO2 of 215g/km. However, from April, it will attract the top 35% rate, which will add £300 to a 40% taxpayer’s BIK bill. Petrol cars hit the 35% band with CO2 emissions of 230g/km or more. The Association of Car Fleet Operators has long recommended companies look at low-CO2 vehicles to keep running costs under control, as well as offering the best stability against reducing CO2 thresholds. There is still a significant BIK tax advantage for choosing cars with CO2 emissions up to 120g/km, and there is more choice than ever. 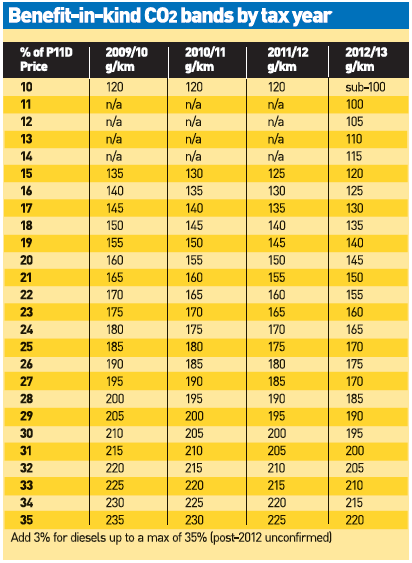 However, fleets need to advise drivers that while a car currently emitting less than 120g/km CO2 will attract the lowest BIK rate of 10%, in 2012 that lower threshold is removed (see table below). On a Fiat 500 1.2-litre petrol car, which emits 114g/km, BIK will rise from 10% to 14% – it means a £74 increase in a 20% taxpayer’s annual bill. As well as most lower-medium cars now having at least one version below 120g/km, many larger cars also fall under the threshold. BMW and Audi offer versions of the 3-Series and Audi A4 that currently qualify for BIK at 13% while Mercedes-Benz is working on a 119g/km version of the C-Class, which should arrive in the UK by the end of the year. Meanwhile, Volvo has achieved 119g/km for DRIVe versions of its S80 and V70 models – currently the largest cars to offer such low CO2 emissions. Changes to vehicle excise duty could present fleets with an opportunity to reduce costs by switching choices to a model in the same class but with lower CO2 emissions. For example, a fleet choosing a Vauxhall Insignia 2.0 CDTi SE with CO2 emissions of 154g/km would pay annual road tax of £155, while an EcoFlex version would face a bill of £110. Although the premium for Ecoflex is a few hundred pounds higher per model, the fuel savings would add to the lower road tax and potentially make it more cost-effective. Vehicles with CO2 emissions up to 100g/km remain free to tax, and there is a growing list of eligible cars, although in some cases the cost of the technology required to reach such low emissions might work out more expensive long-term. Fleet operators will soon have a choice of petrol-electric hybrid models below 100g/km – although both are Toyotas – with the Prius and Auris HSD (due in July). Meanwhile, Ford, Volkswagen, Seat, Audi and Volvo all offer lower-medium cars with variants producing lower than 100g/km. Cars in bands B, C and D will actually cost slightly less to tax from April 2010 than they did last year, while vehicles further up the scale will face increases of £20-£30 a year. But the new ‘first year rate’ or ‘showroom tax’ also takes effect from April. Showroom tax is a first-year equivalent of vehicle excise duty designed to encourage people to choose lower-emission models and penalise those opting for higher levels of CO2. The table shows that many low-emission cars will not be liable to a first-year charge, while replacing the tax disc after the first year results in a relatively low payment. High-CO2 cars will face punitive first-year charges of more than double their annual road tax thereafter – a factor that will add to the overall costs of running many vehicles. 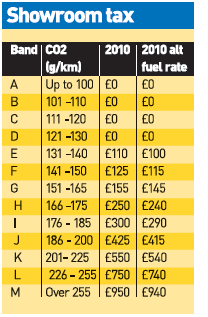 The top rate for cars with CO2 emissions of 256g/km or more is £950. There are some cars that you might not expect to face high first-year rates. For example, the Land Rover Freelander diesel is now fitted with stop/start technology for manual versions, but the system is not yet fitted to cars with automatic transmission. Therefore, the Freelander 2.2 TD4 automatic with CO2 emissions of 214g/km would face a first-year rate of £550 from April, although its annual rate thereafter would be a more palatable £245. It might be a stretch to applaud the Treasury for generosity towards electric vehicles – if their use was more widespread, perhaps there would be fewer incentives for fleets to choose them – but anyone driving an electric car or van will have a BIK tax payment holiday for five years. Electric vehicles still occupy a very small niche in the fleet market. Doubts remain over the cost of technology which delivers a maximum range of 100 miles and requires six hours to undergo a full recharge. A widespread and reliable recharging infrastructure is also required to encourage significant take-up. But with several mainstream manufacturers committed to introducing battery-powered cars in 2011, by which time the Government will also fund up to £5,000 of the cost of purchasing an electric vehicle, there might be many drivers eventually able to take advantage of BIK-tax-free driving. Companies choosing electric vehicles will also benefit from a 100% first-year writing-down allowance. While benefit-in-kind tax bands tighten further in 2011, there are also other changes to prepare for both drivers and employers. It was announced in the Pre-Budget Report late in 2009 than Class 1A National Insurance contributions will increase by one percentage point in 2011, from 12.8% of the car’s P11d value to 13.8%. This means the cost of providing cars to employees will rise unless fleets succeed in encouraging staff into lower-emission, less costly vehicles. Hybrid vehicles will face higher taxation from April 2011 because the alternative fuel discount in vehicle excise duty and company car tax will be eliminated. It means companies offering the larger hybrid vehicles now – such as the Lexus GS450h and Lexus LS600h – should consider the impact on drivers who could face steeper rises in their company car tax from next year than through the usual 5g/km reduction in BIK tax thresholds. Now you know about taxation why not calculate the costs for your fleet car tax by using the fleet news car tax calculator.